Concord Wirebound Telephone and Fax Index Book A5 87110/CD10 Pack of 1 Combination telephone and fax reference book, ideal for home or office. Laminated board with wirobound spine. A-Z index with clear mylar reinforced tabs. Black and Grey cover. 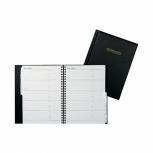 Collins Wirebound Business Address Book A5 Black BA5 Pack of 1 Wirobound with padded Vinyl cover and tabulated index. The Collins Business Address Book is available in Black, boxed. 210x148mm. A5. 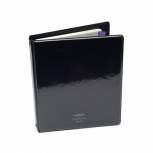 Concord Telephone Address Binder A5 Black 83010/CD6 Pack of 1 PVC binders, colour co-ordinated loose leaf A-Z index sheets with mylar reinforced tabs and punch holes and untabbed continuation sheets. Refill packs of the A-Z index and the continuation sheets are also available in five colours on request. Black. Guildhall Telephone Address Book A5 Blue DTAA5/BL Pack of 1 Goldline Telephone Address Book. 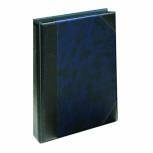 Loose leaf address book featuring an A5 binder with a 25mm 3-D ring mechanism and lightly grained Blue padded cover. Supplied complete with 30 leaves. Rigid A-Z index. 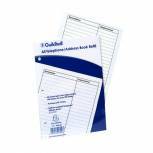 Guildhall Ruled Telephone Address Book Refill A5 GA5/R Pack of 1 Refill Sheets for the Goldline Telephone Address Book. A5. For the complete address book see GH06027.